Made with environmentally friendly materials; a durable plastic design and a 6 prong head makes it easier to place the ball on the tee and keep it stable. With its added durability and contoured cup, this tee gives top performance to all golfers, from amateurs to professionals. 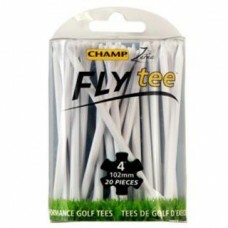 The CHAMP Zarma FLYtee is a new performance tee that will increase your distance and accuracy from tee to green. Made with environmentally friendly materials; a durable plastic design and a 6 prong head makes it e..